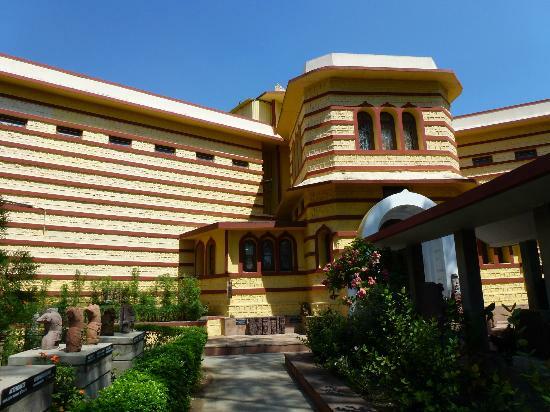 Together with the Lakshmi-Narayan temple next door, the Birla Museum sits serene in a beautiful setting on the on the Arera Hills. The red and white sandstone building entered by steep steps, it houses an extensive 4,000 volume library of art and culture, terracotta sculptures and manuscripts. 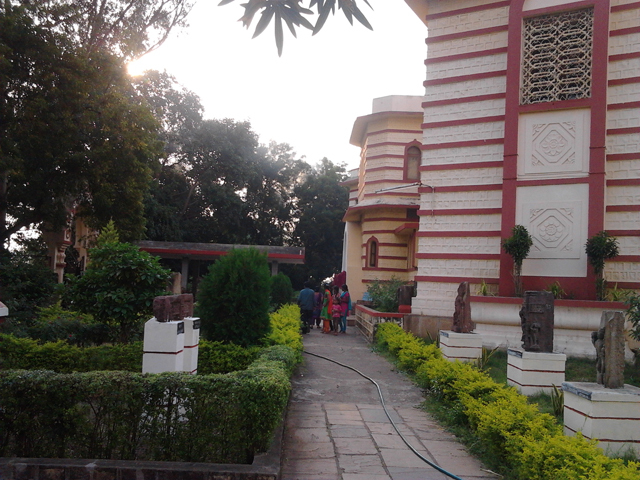 The Birla Museum is a must for lovers of archaeology, but there is little effort to keep for the average “Philistine” tourist interested. A lover of history, I was enthralled. I immediately began photographing the gardens, aided by one of the staff, only to be told that photography was not allowed. I would have loved to show you more of the very special artefacts inside! 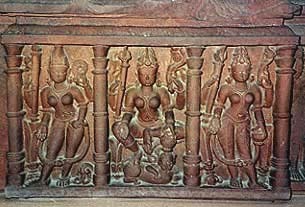 Durga Trimurti, 12th century, from Sagar. Not to be missed is the 12th century Durga Trimurti. In her Trimurti form, Durga where the goddess is depicted with the attributes of the Hindu Trimurti of Shiva, Vishnu and Brahma. The central image shows her on her lion, flanked by her depicted standing. The colourful Kondapali toys make for a refreshing display. These toys traditional to Andhra Pradesh are made of soft wood and tamarind powder and enamelled gums. They are painted with bright water colours to depict mythological figures and village scenes. 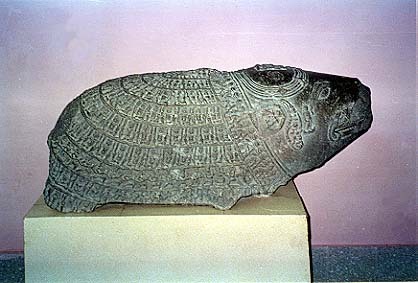 A ninth century image of Varahi, the feminine form of Vishnu’s boar avatar in the Devi gallery. A head of a Salabhanjika, or stylized woman grasping a branch, depicts a tree spirit. 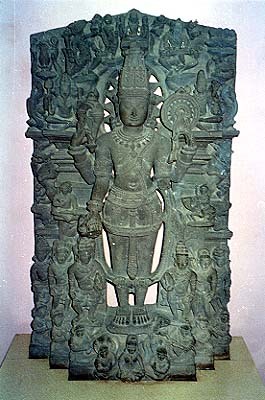 A 12th century Vishnu holds a conch and discus, surrounded by attendants and deities, including Brahma and Shiva. Unfortunately, in our over hyped super sensory world. Tourists can be a necessary but despised breed. Wanted for cash, but despised for their Philistine disregard for subtlety of tradition. Tourists need to be engaged or they lose interest. This is perhaps why the Birla Museum is not rated highly on TripAdvisor.com. People complain it is boring, and not been allowed to take photograph means you walk in look around and leave. Perhaps, a guide, or an audio headset that explains each display will engage people more. For lovers of archaeology, there a booklets for 20 rupee detailing the artefacts with black and white images. Six colour post cards are available for 20 rupees for the set. I hope the collection will be digitized, perhaps as a CD so people can enjoy the beautiful art when they return to their home country. Apparently, the museum workshop makes limited display replicas for purchase. Without a vehicle, I will return later to purchase one. The terms ecotourism or cultural tourism seem oxymorons. Tourists are seen as culturally ignorant and tourism is accused of changing the very thing come to see. Thinking of the neaby Union Carbide site, I recognise frustrated sceptics feel justified in describing Social Justice tourism as “self righteous arrogance”, “hypocritical” and “ironic”. However, museums importantly allow locals to appreciate their heritage, and tourists a chance to treasure a world I hope is never forgotten.